It has happened! As Pets of the Homeless has spread across the U.S. and Canada, it became apparent a larger headquarter office facility was necessary. Pets of the Homeless is now located at 206 S. Division St, Suite 10, Carson City, NV 89703. 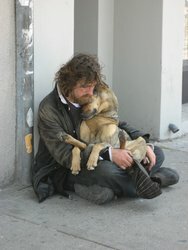 Pets of homeless do not choose their owners. Yet they remain loyal and give unconditional love. Feeding Pets of the Homeless, also known as Pets of the Homeless, is a non-profit, volunteer-based organization that provides pet food and veterinary care to pets of the homeless and less fortunate in local communities across the United States and Canada. Pets of the Homeless believes in the healing power of companion pets and of the human-animal bond, which is so important to life. The organization understands; beyond companionship, these pets provide protection and warmth for their owners. Additionally, most people experience homelessness for only a short period of time, and for those with pets, finding shelter is much more difficult. Pets of the Homeless provides support in communities across the Nation in several ways. Pets of the Homeless volunteer collection sites gather donated pet food and deliver it to participating food banks and/or soup kitchens, which have agreed to distribute to the homeless and poor. Through the grant program, Pet of the Homeless provides resources for vaccines and veterinary care to pets of the homeless via participating licensed veterinarians. The Pets of the Homeless Crate Project is a solution, making it feasible to allow pets and their owners into homeless shelters who would otherwise stay on the street because of restrictions against pets in shelters. Approximately 85% of donations go directly to programs that help save companion pets. Administration costs fall far below the acceptable 35%. 1. Become a collection site at your business. 2. Volunteer to sponsor a business and work with them to get the program working in your community. 3. Pet food and supplies are needed in communities across the Nation. Visit the Collection Sites page on the website to find a pet food collection site in your community. 4. Gifts of cash can be designated in various ways. 5. Spreading the word about Pets of the Homeless to your friends, family, coworkers, and local businesses is another way to help. Visit the web site for more detail on all of the ways in which you can help and donate. Donations are tax-deductible under section 501(c)(3) of the IRS code. Tax ID 26-3010540. Gifts may be made in memory or in honor of a beloved pet or special person in your life. New headquarters office at 206 S. Division St., Suite 10, Carson City, NV 89703.